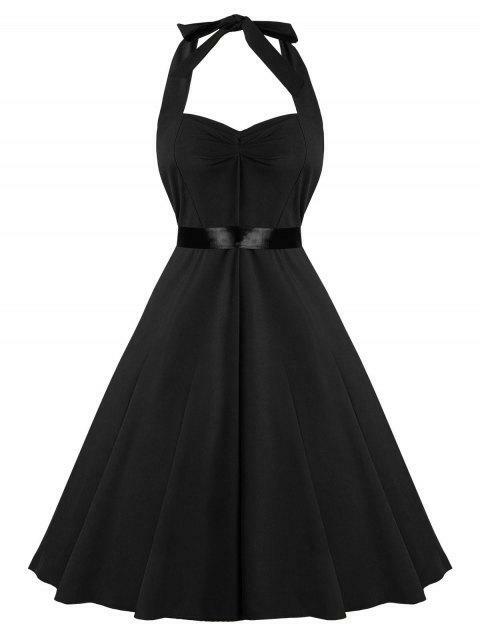 This halter vintage dress featuring a sweetheart neckline, attached self-tie belt, fit and flare silhouette, and concealed zip closure at lower back. Material looks diffrent than picture and rather cheap, but dress is nice. I love the dress, I'm really into black and it fits very well. XL is US size 10 and the size 2XL is US size 12. Q:What size is the large? The measurement in CM for size L is: bust:74 waist:80 length: 93. Q:1) Hi, - what size is a Medium? ie - 10-12? etc. Many Thanks! Penny 2) How does shipping work? The size M is US size 6.